More than 430 years ago, the first Rashbi hachnassas orchim group was formed in Meron to prepare for the special day’s gigantic crowds. In 1998 Rabbi Yehoshua Biderman founded Yeshuos Rashbi to continue this tradition. This year Yeshuos Rashbi is preparing for thousands of visitors and hosting the single largest Seudah Hilulah for Rebbe Shimon Bar Yochai. We have prepared over 19,500 portions; that is almost 2 tons of meat! 10,000 bottles of soda! 71000 cups! 3900 chairs! 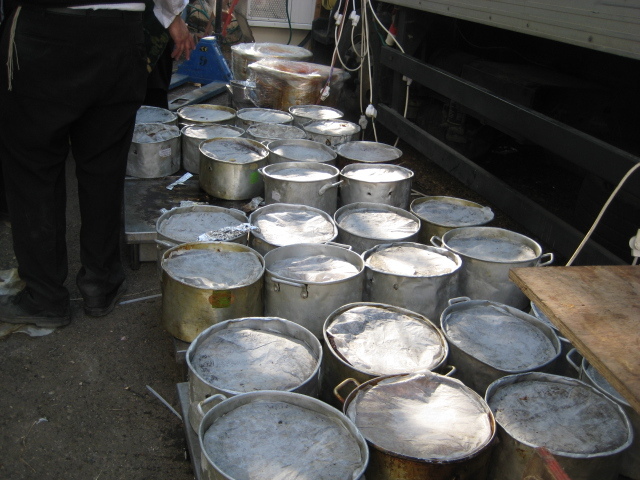 130 pots of Yerushalmi Kugel! Last year Yeshuos Rashbi prepared for thousands of visitors and hosted the single largest Seudah Hilulah for Rebbe Shimon Bar Yochai. Every year the crowds increase and we are preparing even more. It is known that the kever of Rebbe Shimon bar Yochi is steeped in ancient majesty. Everyone who visits the site feels a strong spiritual stirring, an incredible longing to cleave to Hashem. The soul yearns to be with its Creator; a pathway opens and stretches directly heavenward. You can have a part in creating this simcha on Lag B’omer in Meron. Come join us for the largest Seudas Hilulah in Meron on Lag B’Omer. If you are not able to be in Meron, you can be there in spirit. By increasing the simcha on Lag B’omer in Meron Rebbe Shimon will increase the simcha in your life.